Current World Daily: INSANE! Ireland's Village Magazine Cover Shows Gun Target on Pres. Trump's Head ! INSANE! Ireland's Village Magazine Cover Shows Gun Target on Pres. Trump's Head ! 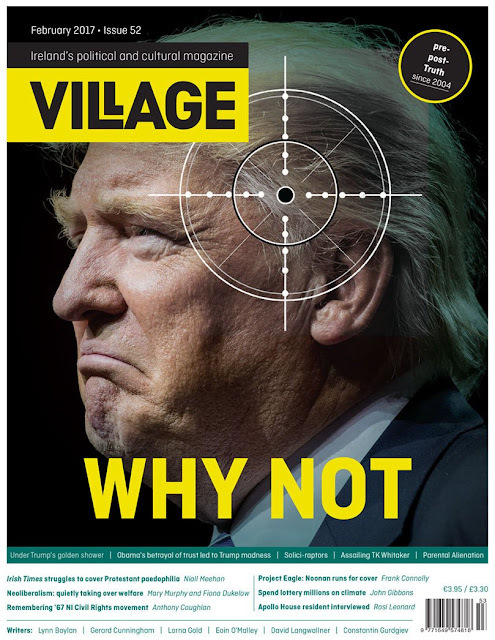 "The February cover of Ireland's Village Magazine has sparked outrage after portraying President Donald Trump's head with a sniper target locked on it. Village is a left-leaning monthly publication that dubs itself "Ireland's political and cultural magazine.""